Sir, do you have any pork? They keep the line moving. They’re very precise. 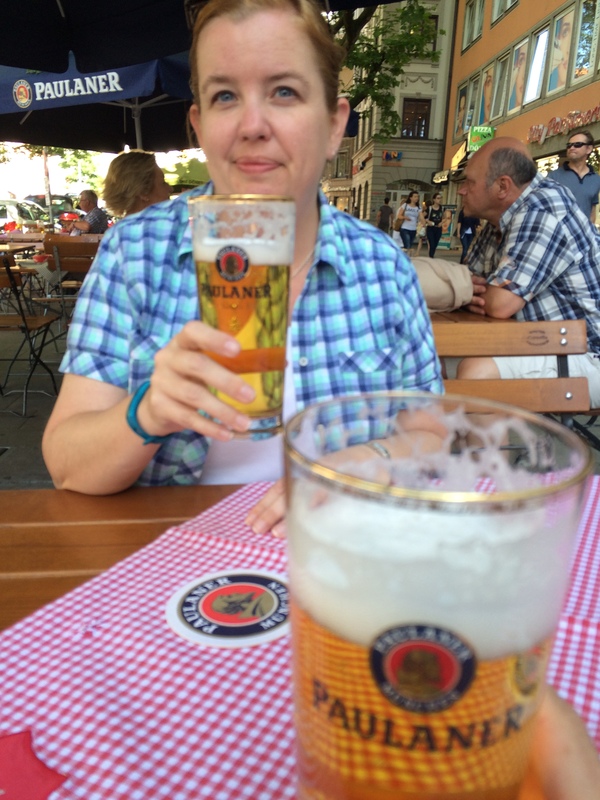 Bamberg was our last day in Bavaria. We drove over in the morning and the first stop was the cathedral. We wandered around inside and out. It was a strange placement on the top of the hill and set so there were two west entrances instead of one with a big chapel separating them. See? It was odd to see that chapel stuck in the middle there. 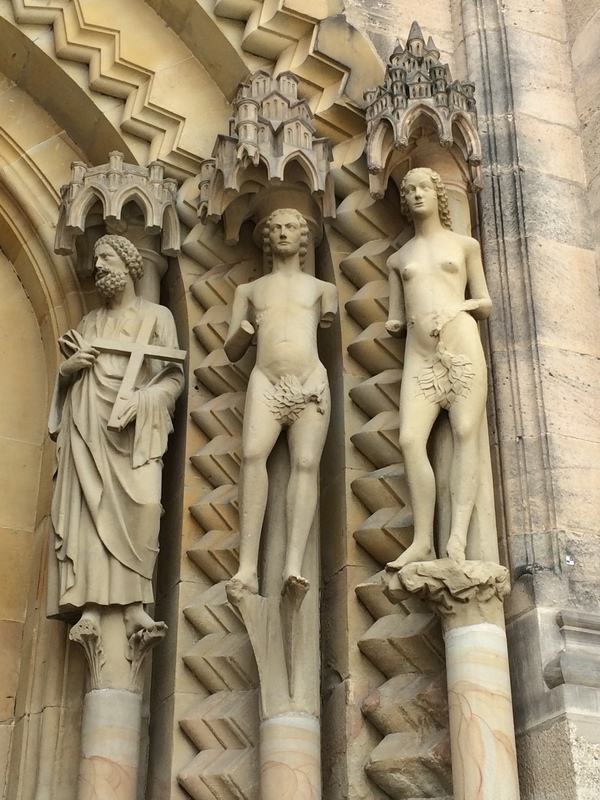 The Adam and Eve portal sculptures were also rare and interesting. We had lunch in the rose garden of the Imperial Palace which was right across the oddly shaped square from the cathedral. 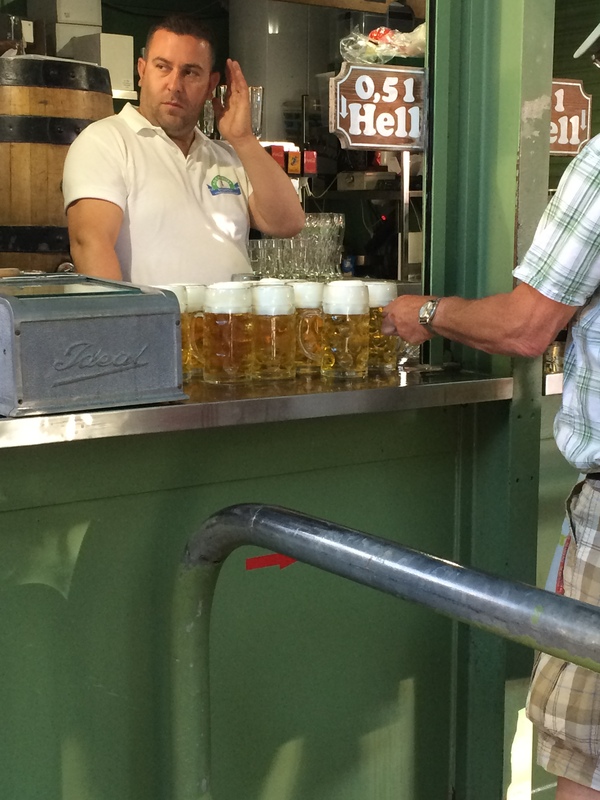 And I will not shock you, I am sure, to tell you beer and pork were consumed. 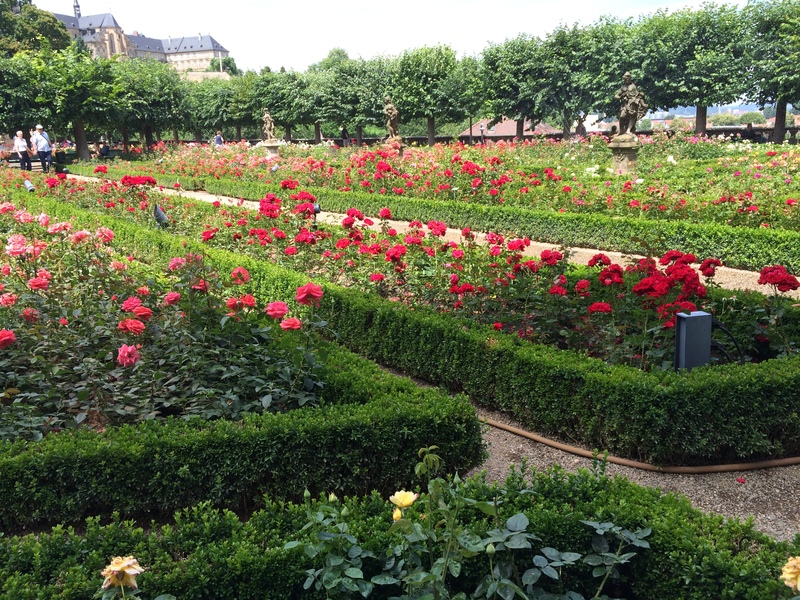 The rose garden. A lovely spot for lunch. 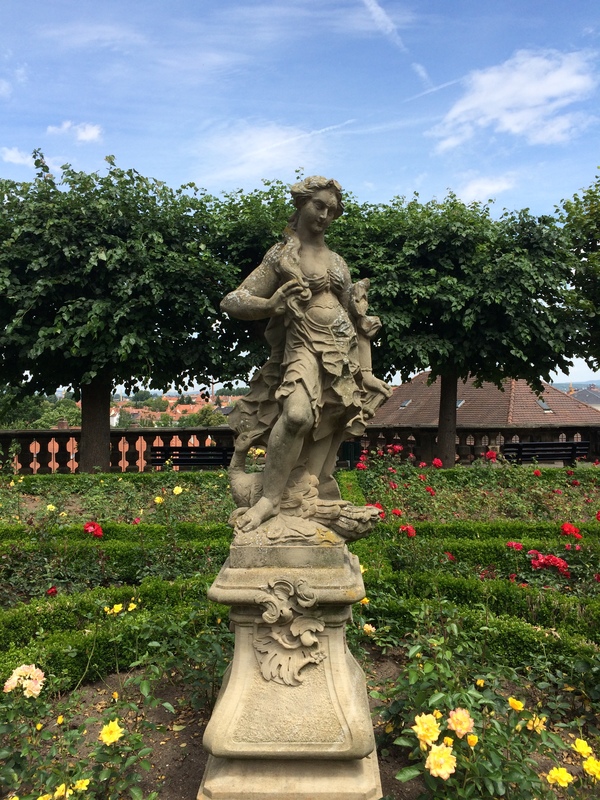 The garden itself was very pretty and had a series of Greco-Roman statues. I thought Hera with her peacock was the prettiest. The great and wise Hera. After we had sufficient refreshment we wandered down the hill and found the old town. 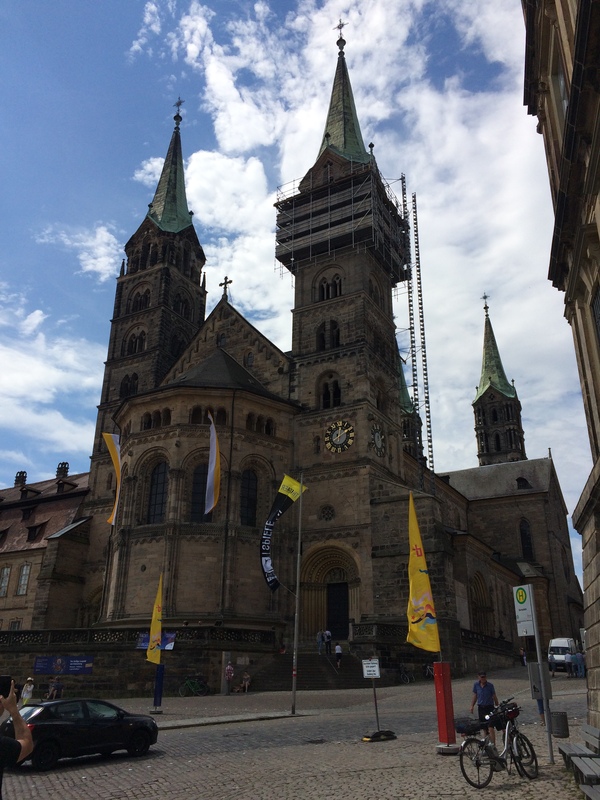 The neat thing about Bamberg is the Town Hall. In the Middle Ages the townspeople wanted a town hall but the Prince Bishop would not grant them land to build it. 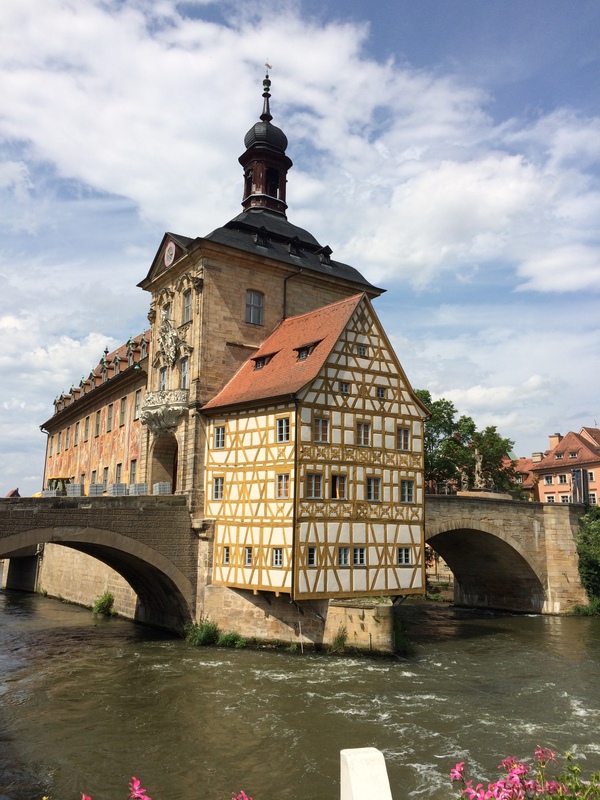 So the ingenious people of Bamberg created an island in the middle of the Regnitz and built their town hall on that. The town hall in the middle of the river. 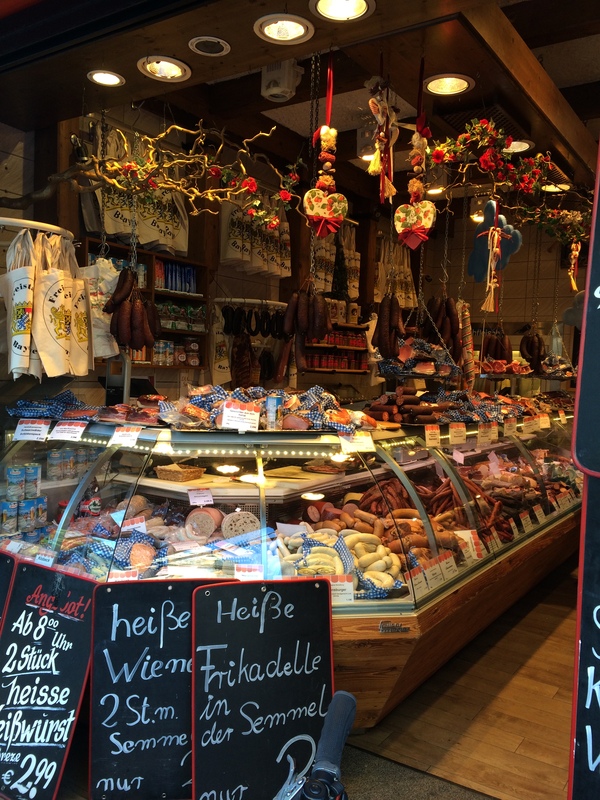 Bamberg was charming. There was ice cream. We had a nice day. I would be remiss if I didn’t mention The Werewolf of Bamberg by Oliver Pötzsch. I read it earlier this year and wrote a review of it here. It was really cool to visit a place I had read about like that. It was fun because I looked like a rock star (albeit a totally nerdy one) because I already knew the name of the river and the fact that the town hall was built into the river. The entire Hangman’s Daughter series I recommend as a whole. From one nerd to another. I like Hera and her peacock. (There’s a surprise.) That is quite a large pine cone Adam is wearing. Love the town hall. It must be hard not to take good pictures there – everything is so quaint.